Sunny Jacobs and Peter Pringle were married earlier this month. Read the charming account of the wedding, and of their lives, in the New York Times. 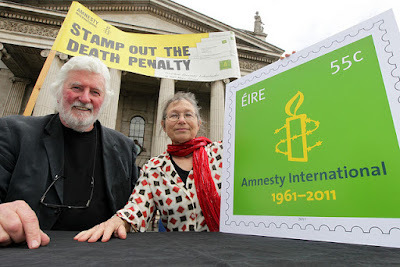 Both Sunny and Peter were sentenced to death, Sunny in Florida and Peter in Ireland, and both were later exonerated. They met in Galway many years ago when Sunny was doing a lecture tour for Amnesty International as part of a campaign against capital punishment. Sunny and Peter have often visited the Irish Centre for Human Rights where they have spoken with students about their lives on death row. Congratulations to you both and warmest wishes for a happy life together! Human Rights and Iran: Engagement or Boycott?